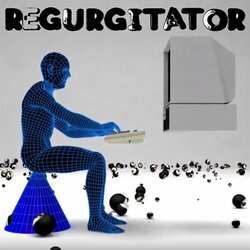 Regurgitator formed Brisbane by Quan and Ben, with drummer Martin Lee, playing their first show March'94. Current drummer, Peter Kostic joined late ‘99. They have released numerous EPs/albums, recorded in dubiously idiosyncratic scenarios: Tu-Plang (1996) in the remote jungle outside Bangkok; triple platinum selling Unit (1997) in a condemned Fortitude Valley warehouse; …art (1999) in a sun soaked Byron Bay beach house; Eduardo & Rodriguez Wage War on T-Wrecks (2001) in Gang of Four Andy Gill’s London lounge-room; Mishmash (2004) in a glass box in Federation Square as the Band in a Bubble parody; Love and Paranoia (2007) in a bullet riddled studio in Rio de Janeiro; Superhappyfuntimesfriends (2011) in Ben's Melbourne shopfront; and (2013)’s Dirty Pop Fantasy in a Hong Kong skyscraper apartment; and the recent meta-virus HEADROXX (2018) fabricated across the internet. In the past 24 plus years they have toured Australia, NZ, Japan, UK, Europe, USA, Asia and the Middle East including numerous festivals. Always drawn to the odd, still touring and flooring it… more than ever they find themselves extending the vitality of their live performances, continuing to infuse them with exuberance, mania and their mashedup motion of rock, punk, electro, funk, pop, whatever goes vibes. News in: fibre-optic spirals will make the Internet 100 times faster than it is today. That means the only viable way to process exponentially burgeoning cancer of shizzput will to become a robot. The question is will I self-engineer quick enough to accommodate it or will my body become hopelessly beached and shrivel up on the lonely shoreline of society?